Seat consisting of a seat cushion, a seat back and a head restraint which can all be adjusted to adapt your position for ease of driving and comfort. Push the control forwards or rearwards to slide the seat. Tilt the rear part of the control upwards or downwards to obtain the required height. Tilt the front part of the control upwards or downwards to obtain the required angle. The electrical functions of the driver's seat are deactivated approximately one minute after the ignition is switched off. To reactivate them, switch on the ignition. 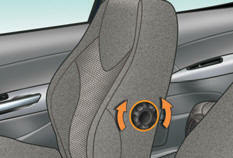 Tilt the control forwards or rearwards to adjust the angle of the seat back. To raise the head restraint, pull it forwards and upwards at the same time. To remove the head restraint, press the lug A and pull the head restraint upwards. To put the head restraint back in place, engage the head restraint stems in the openings keeping them in line with the seat back. To lower the head restraint, press the lug A and the head restraint at the same time. The head restraint is fitted with a frame with notches which prevents it from lowering; this is a safety device in case of impact. The adjustment is correct when the upper edge of the head restraint is level with the top of the head. 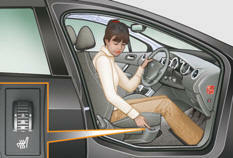 Never drive with the head restraints removed; they must be in place and adjusted correctly. Turn the knob to obtain the desired level of lumbar support. Placing this seat in the table position, with the rear seats also in the table position, allows you to transport long objects. Pull the control upwards to fold the seat back onto the seat cushion. 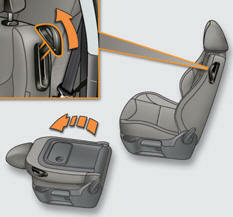 To lower the seat back fully, tilt the seat back angle adjustment control. Pull the control again to release the seat back and raise it. When put back in place, the seat back returns to its initial position. Do not forget to fold the "aircraft"
type table fixed on the back of the seat first. With the engine running, the front seats can be heated separately. System which registers the electrical settings of the driver's seat and door mirrors. 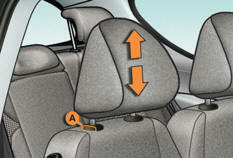 It enables you to store and recall two positions using the buttons on the side of the driver's seat. Adjust your seat and the door mirrors. Press button M , then press button 1 or 2 within four seconds. An audible signal indicates that the position has been stored. Storing a new position cancels the previous position. Press button 1 or 2 to recall the corresponding position. An audible signal confirms that adjustment is complete. You can interrupt the current movement by pressing button M , 1 or 2 or by using one of the seat controls. A stored position cannot be recalled while driving. Recalling stored positions is deactivated 45 seconds after switching off the ignition.